"I started tracking my tennis statistics against my playing partner and noticed my 1st serve % was well below where I thought it was. This watch helped me become more effective by allowing me to monitor my 1st serve % and then serve more or less aggressively depending on the percentages." "I love tracking my stats and then bringing them home and entering them into my spreadsheet. It's interesting to see how my performance varies against different playing partners and helps me to target areas of weakness in my game." "I've been taking lessons and my coach loves the data I've been collecting with this watch. We use the data from my club matches to identify areas for him to work on with me." I've always wanted to know how my stats stack up against the pros I see on TV. I can even track the pros stats while watching them on the tennis channel making the matches more interesting. "It's great that I don't need a coach or anyone to watch me play to get my stats. I can keep my own easily while playing pickup games even." The Pros know their Stats, why shouldn't you?? KEEP YOUR STATS & PLAY ACCORDINGLY! Play like your on the ATP Tour! Finally, a tennis statistics tracker where you can easily take your own tennis statistics for all your pick-up, club and even tournament matches with a simple touch of your watch. After playing with this watch for about 20 minutes, you will not even notice it and taking your stats will become a habit! With plenty of time during those boring lulls in between serves and during changeovers, you will have plenty of time to take your stats, analyze them in mid-game and make changes to beat your opponent. You don't have to be playing wimbledon or on the ATP tour with statisticians on the sidelines with expensive tennis software to know what your 1st serve percentage is or to know how many winners you can brag about to your friends. Now you can track your performance and train according to your tennis stats or even change your game plan during the match. In Tennis, you're only as good as your serve. Now, you can take your own tennis serve statistics without requiring a coach or a third-party on the sidelines keeping track with tennis software. You can track your 1st and 2nd serve percentage even in a pick-up game. Haven't you ever wondered how many Aces, Winners or Unforced Errors you had in a pick-up game or during a club match? Wouldn't it be nice if you could get an accurate reading on your serving percentages or unforced errors to know how aggressively or safely you should continue playing? This slick x-games style tennis watch answers your questions and gives you valuable feedback about your tennis match statistics. Above is a representation of how the pros tennis statistics are kept. 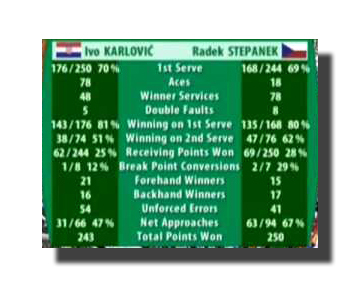 This was a match between Karlovic and Stepanek where Karlovic had a record 78 aces and only 5 double faults. The pros utilize these tennis statistics but need sophisticated tennis software and expensive coaches and statisticians to help them. Each tennis statistic line is important. 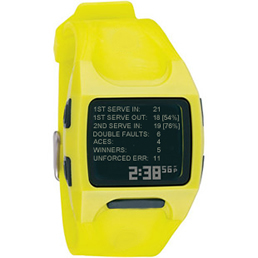 This watch will help you keep track of almost all the tennis statistics they show on TV when you watch majors. There is enough time in tennis during change-overs or in between serves to take a quick look at your watch and see how you've been doing with the different tennis statistic categories. It is also very simple and becomes habit after about 10 minutes of playing to click the appropriate tennis stat button on your watch based on the outcome of the point. There are only 7 different tennis statistic counter buttons on the watch	so	it doesn't take long before the location of the buttons are committed to memory and you will not even have to look down to know which button to push for a missed 1st serve for example. We highly recommend utilizing this stat tracker in your practice matches to see how you are doing with your serve percentages before you arrive at your amateur, high school, college or pro tennis tournaments. Training in Tennis is tough enough, why not make it easier with this highly efficient tennis training aid. Are you thinking about going to tennis school or hiring a professional tennis coach, this is a device to help you and your tennis coach judge your game's efficiency. The tennis serve is called the most important shot in tennis. If you really want to make a difference in your game, this device will help you track your progress. In addition to the tennis stat tracking, with the the stop watch, we will show you how to utilize our "TENNIS FASTEST SERVE" function. With the help of a partner, we will show you how to time your serves to see how fast you are serving and gauge your tennis speed in mph without the need of a radar gun. Who knows, you may already have one of the fastest tennis serves around! Your tennis serve speed may be faster than you realize. Contrary to popular belief, it's not that hard to serve 100MPH. Are you addicted to tennis? Do you even like "Balls Out Tennis Coach" the movie? If so, this will be a welcome addition to your tennis game. Give it a try and IMPROVE YOUR TENNIS GAME! Copyright. Tennis Stat Tracker. Patent Pending. All rights reserved.